June 4, 2009 turned out to be one of the monster sports days. It started off quietly enough as four women with multiple syllables and hard to pronounce names faced off in the French Open semis. But as the afternoon moved on, working in and around parent things, action heated up in the Bronx. The Yankees capped off a rally from 5-1 down. A bases-clearing double by 2009 MVP Candidate Mark Teixeira and a clutch single by A-Rod set the table for The Amazing Melky Cabrera, who came up big again with a 2-run game-winning blast in the 8th. Then Randy Johnson, the Big Unit, collected win #300 – some say he’ll be the last to get there. Brian Wilson closed out the Nationals, striking out the side in the 9th for a 5-1 Giants win just before 7 ET. 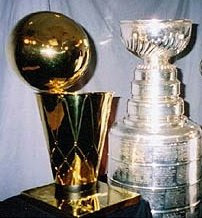 Get the kids to bed and it’s the NBA Finals and the Stanley Cup Finals on the same night. Very odd that it happened. With the potentially long layoff for the NHL since the Wings and Pens easily advanced to their Finals rematch, the start date was moved up one week. The problem was, NBC wanted to launch Conan O’Brien without the risk of a double OT game moving him to the middle of the night. So Stanley Cup Games 1 & 2 aired back-to-back weekend nights on NBC, and Versus got a very reasonable Tuesday/Thursday double-dip in Pittsburgh. I was relegated to my office and my instincts and a remote. My wife used her rare off night to watch Kubrick’s A Clockwork Orange on the big TV. If she went for Full Metal Jacket, it might have been a tough call. If it was Eyes Wide Shut, she probably would have gotten me out of the house. With the 1-hour stagger you really can watch both, even on one set. The NHL game was the superior product, at least on this night. It’s not really a fair fight as it was Game 4 vs Game 1. The scene in Pittsburgh had a lot more intensity despite Leo, Jack, et al in LA. The Red Wings were looking to seize control of the series. They led 2-1 in the Finals, and were up 2-1 on the road early in the 2nd Period. They got back-to-back Pittsburgh penalties, and were looking to ice the game and, effectively, the series. But Jordan Staal got a steal and scored shorthanded for the tie. Right after they killed the remainder of the penalty, Sidney Crosby scored the go-ahead. Then Sid set-up Tyler Kennedy on some gorgeous pinball action. It was 4-2 home team and the Igloo was on fire. Talk about a House of Pain ! The electric 2nd Period ended just in time to see The Magic get spunky early in LA. Jameer Nelson's return further bolsters the St. Joe's rep - that "The Hawk Will Never Die." But the Lakers woke up in time to go on a 25-10 run to end the 1st Half. And as intermission approached in one venue, action began in another. The Pens got strong goaltending from Marc-Andre Fleury throughout the final period and got even. Now they're headed back to Detroit for Game 5. Since hockey concluded in tidy regulation, I got to see the Kobe show in the 3rd Quarter. Certainly looks like a man on a mission, playing with a ferocity that we haven't seen from someone so smooth. Interesting to see if Versus, which had a very nice rating on Tuesday, made a dent in the mighty NBA on ABC. They had the better product and some fortunate timing.